On Sale Now! Save 7% on the Frontier Lemon Pepper Certified Organic, 16 Ounce Bag by Frontier at The Flavour Stack. MPN: BWC03629. Hurry! Limited time offer. Offer valid only while supplies last. Frontier Lemon Pepper comes in 16 ounce bag. This combo of culinary favorites complements fresh and cooked dishes, at the stove and at the table. 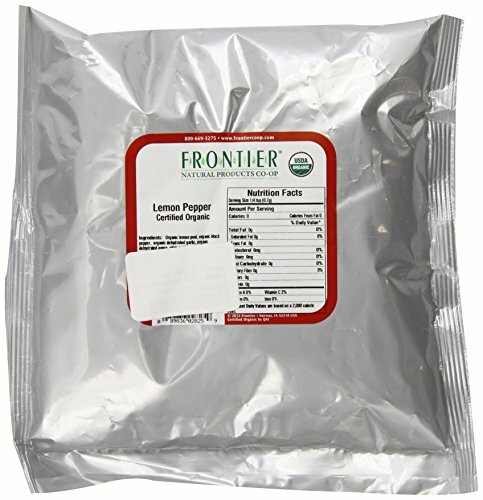 Frontier Lemon Pepper comes in 16 ounce bag. This combo of culinary favorites complements fresh and cooked dishes, at the stove and at the table. Zesty lemon and lively pepper perk up every savory dish. Here they are along with onion and garlic in one convenient blend.